Revolutionizing the Tenant/Landlord Experience One Property at a Time! Learn how leaders in Commercial Real Estate are leveraging Tenant Portal technology to expand service offerings, lower costs and increase revenues. 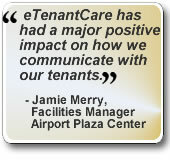 This live 20 minute presentation covers the core features of eTenantCare's Tenant Portal solution. © Copyright 2012-2013 eTenantCare, LLC. All Rights Reserved.